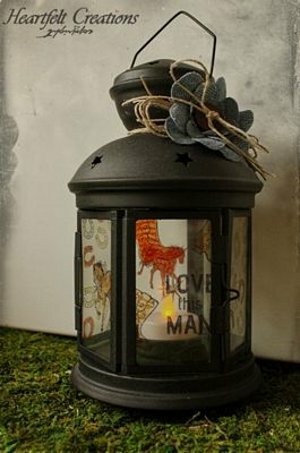 Set the mood for a cool western style evening with this Bronco Lantern from Heartfelt Creations. This lantern style lamp is perfect for a cowboy themed bedroom or birthday party. It's easy to make and little cowboys will love it! Measure glass and cut transparency film to size. Stamp images using India Ink. Heat set carefully (just enough to dry ink). Color on reverse of image with Copic Markers. Attach transparency panel to inside of lantern inserting into existing clips/glass. Cut flower petals from jean material then apply Glossy Accents to edges so they don't fray. Tie twine bow around top of lantern, then attach flower with additional twine and bow. Insert battery operated candle only. Not suitable for real candle as the plastic transparency will melt.